Welcome to the Red Mount Church Cemetery. This site was created in order to provide genealogical and historical data to the public regarding the cemetery and its rich history. The web site includes a list of Veterans who served their country in wars from the Revolutionary War to the Vietnam war, as well as in peacetime. These veterans are also listed in the Interments page. Red Mount Church Cemetery was established in 1829. The cemetery, however, pre-dates that year with the oldest known interment in 1765. The cemetery was originally known as the Bower's Graveyard. The vicinity also included a school known as the Bower's School. The original part of the current church building was constructed in 1888. Another feature that will be very useful is a plot plan map. The cemetery has been divided into two parcels, North and South, for better management of information relating to the interments. 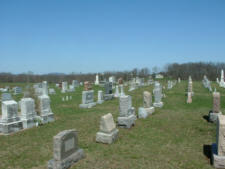 From the maps a visitor will be able to view pictures of head stones and photos of sections within the cemetery. The links to maps and photos will be provided in the future. Also, photo links will be added for the interment page so that an individual stone can be viewed. If there are any requests for information about a particular interment, please contact the parish office via the email link below.